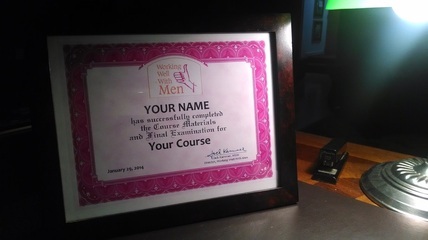 Inspires and informs your workers about engaging and working with men. Helps staff understand the importance of including men in programs and services, and offers new strategies and insights for doing so. Lets men know you care about their needs. Improves male morale by emphasizing what men can do right. Reinforces and motivates pro-social behavior and attitudes. Reminds mothers of the importance of fathers, keeps the focus on the children. Helps women appreciate and harness the non-monetary value of men. Improves women's empathy for men's struggles. Works on desktop and laptop computers, both Windows and Macintosh, plus mobile devices, including iPad and Android tablets. Clients without their own computers can log on from a public library -- or right at your agency if you have a room for computer training or online job searches. If you are a manager with budgetary authority, you can get free trial enrollments for the courses you are considering for purchase. Limit seven. If you're not pleased with the service and request a refund within five business days of courses being made available to your users, we'll provide a full refund of your purchase. No questions asked. Courses are brief and convenient (30-45 minutes including Final Examination/Quiz); can be easily worked into tight schedules. Courses include text, charts, graphics, animation, audio, video. Quizzes/Examinations include multiple choice, short answer/fill-in-the-blank, and true-false questions. Accessibly written at a tenth-grade reading level. Built with technical simplicity in mind. Little or no time and money wasted on IT or computer "glitches." Compatible with less than state-of-the-art computer systems still in use in many social service agencies today. Requires no software add-ons or downloads and no special computer configuration. Before you purchase, run a free System Check on your computers to make sure your system and the Learning Platform work well together. Click here. Agency designates a specific cohort of people — clients or staff — to be assigned to a course or a specific list of courses. Example: Agency staff wants to start a fathers group and therefore gets management approval to provide an online course to a certain group of client fathers to spur and gauge their interest. Example: Agency management wants to begin a conversation about improving the agency’s work with men and therefore assigns a group of classes to relevant staff members. Agency purchases certain quantities of enrollments in specific courses to be taken on an ad hoc basis by staff and clients as their particular interests or circumstances suggest. Example: Management wants a course on Fatherhood Skills to be readily available to clients whenever their workers deem appropriate. Example: Management wants to have an inventory of enrollments in certain courses available for staff. Staff can enroll whenever they want. Individual users can choose and pay for their own courses privately. Easy online enrollment with a credit card or PayPal. $3.95 per course, with discounts for group purchases. Users get an attractive, personalized Certificate of Completion, suitable for framing and display, upon passing the final Quiz/Examination with at least 80 percent. Users may attempt the Examination as many times as they require to earn their Certificate of Completion. Certificate provides extra incentive and point of pride, especially for clients who have not experienced much completion or success in their lives.